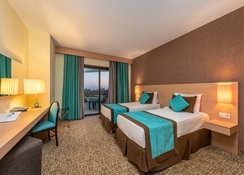 The Grand Prestige Hotel is a 5-star hotel set amidst the lush green Sorgun forest in Side, Antalya in Turkey. The closest beach is just 300m away from the hotel. The hotel has its own private beach. 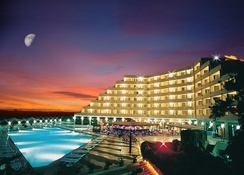 The hotel houses an aqua park, which has multiple swimming pools. There is also a luxury spa on the premises of the hotel. The hotel has over 300 rooms, decorated aptly to suit the local theme and equipped with amenities necessary for a luxurious stay. The onsite luxury spa offers a varied range of local Turkish and globally popular wellness treatments. 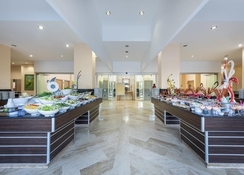 There are multiple restaurants and bars on the premises that serve both in buffet and a la carte style. 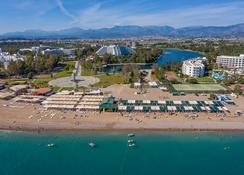 The Grand Prestige Hotel is located 68.9km away from the Antalya airport and 106km from the Gazipasa Airport. The closest beach is 300m away. The town of Side is located 7.4km away from the property. Titreyengol is located 2.3km away from the hotel. 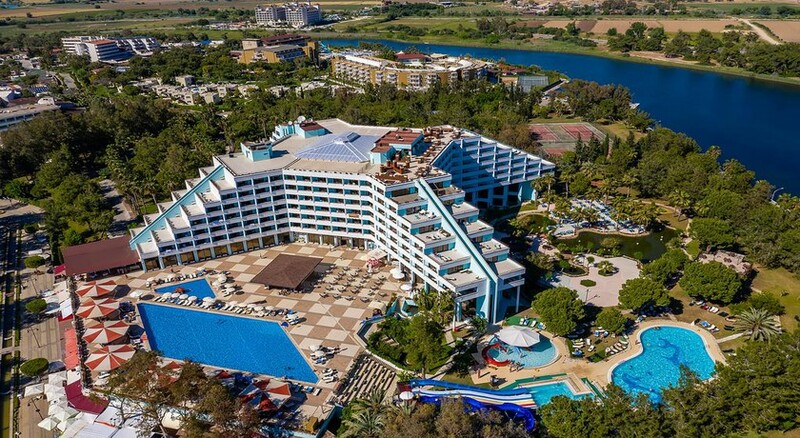 Local tourist attractions like Side Antique City, Side Amphitheatre, Side Museum, Temples of Apollo and Athena, Side Harbor, Manavgat Waterfall and the Green Canyon are located within a range of 13km from the hotel. The Local marketplace is also within a distance of 500m. The Grand Prestige Hotel has 346 rooms, which have been tastefully designed with elements of local architecture and equipped with modern day necessities. All the rooms are soundproofed. The rooms are equipped with facilities and amenities like LCD TV with satellite channels, mini-bar, fridge, Wi-Fi, air conditioning, telephone, room service, bed linens, bath linens, essential toiletries, safety deposit box, etc. The Grand Prestige Hotel houses two restaurants, a bar and an onsite coffee house. 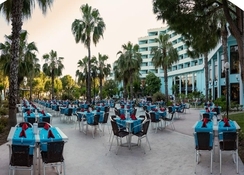 The restaurant serves buffet as well as a la carte menu that include delicacies from local Turkish and international cuisines. The bar is known to serve a wide range of local wines, beers, alcoholic beverages, signature cocktails and non-alcoholic beverages. Guests can also try local restaurants and bars and experience the local delicacies offered. The Grand Prestige Hotel has multiple swimming pools for both adults and children, making the property an aqua park in its own right. The pools have slides suitable for all ages. This feature works as a bonus for the guests. Apart from that, the private beachfront is also a great spot for recreational activities and water sports like snorkelling, diving, windsurfing and canoeing. The guests can also enjoy bingo, aerobics, archery, live performances, themed dinners, biking trips, walking tours, tennis, billiards, darts, fishing, karaoke, table tennis, among others. 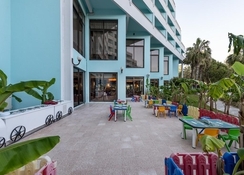 For kids, the hotel has clubs, a playground and a game room.The hotel can also arrange for offsite activities like golf, horse-riding, etc. Hotel needed updating but you could see the work was already being done to it. Animation team were totally amazing made the whole experience worth while. Everything was great, would recommend people to stay at Grand Prestige. The staff and Manager were very freindly. This hotel was a lovely place to stay, on the first day we arrived we made use of the spa and my partner and I both had a Turkish bath and a full body massage, it was amazing! In general the hotel was clean, the bar staff were attentive the only thing I feel let it down was the food, I don’t think we actually had a decent meal that we enjoyed the whole week we were there. There was always loads of activities taking place in the day and the staff were lovely.